Loh Kean Yew won the biggest title of his career in Bangkok today, becoming the first Singaporean since 2004 to become men’s singles champion in a tournament with six-figure prize money. Perhaps Singapore’s Loh Kean Yew (pictured right) hasn’t been waiting all that long for a first major title. Since graduating from the junior ranks in early 2016, he has only played 5 tournaments at Super 300 level or above and two of those were at home. But for Singapore, it had been a very long wait indeed. 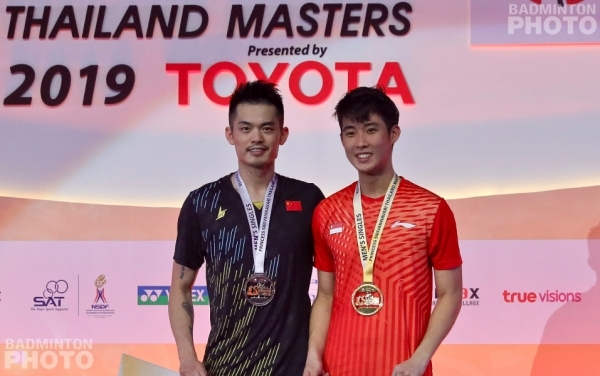 Not since 2012 had the island nation even seen a men’s singles finalist at a Grand Prix Gold event and to find the last winner at an event of this size, you have to go all the way back to 2004, when Ronald Susilo won the Japan Open. The only thing better than winning a big title has to be winning a big title by beating a legend and Loh got that opportunity, too. 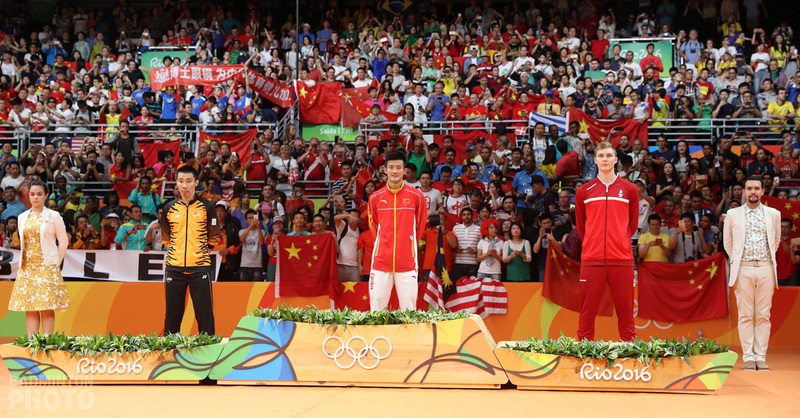 Loh’s compatriot Susilo, of course, enjoyed another moment in the spotlight later that year when he ousted Lin Dan – then newly ascended to world #1 – in the first round of the Athens Olympics. 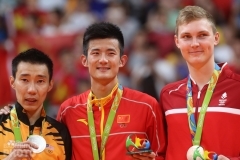 Today, it was a very different Lin Dan who faced a much younger Singapore player for the title in Bangkok. 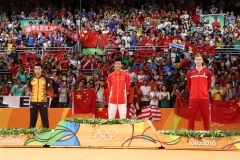 In both games, Lin Dan seemed able to move Loh around the court at will and both times, he was able to build up a big lead. Just when he should have been closing out the game, though, his net shots got looser, his lifts got a little shorter, and he even found himself prone to some wild attacking play, even missing the doubles sidelines on a few occasions. Loh, on the other hand, took Lin’s brilliance in stride and refused to let his confidence waver or let his nerves get the better of him. He kept up his attacking play and pulled of some amazing defensive plays and whittled away at Lin Dan’s lead, winning on a 7-point run in the first and gradually clawing his way back from 6-13 down in the second until a 6-point run put him in position to finish it 21-18. 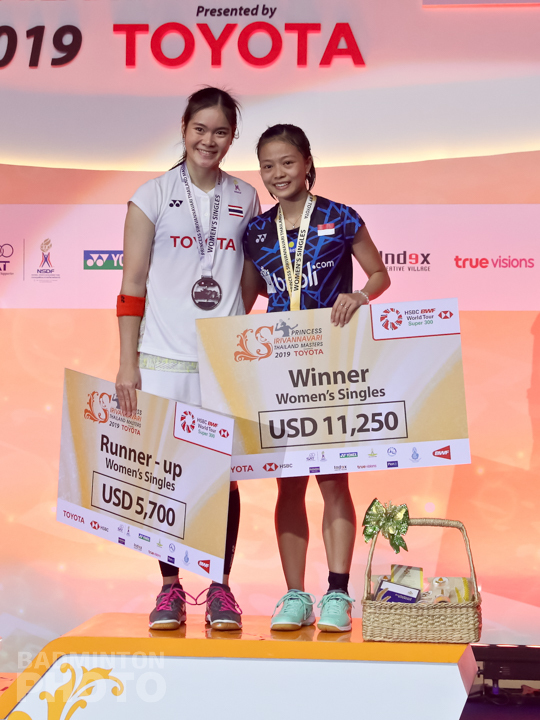 Indonesian women’s singles players may have kept racking up the odd title or two in the first 10 more years after luck ran out for Singapore’s men but it had still been over 4 years since Adriyanti Firdasari won the Indonesia Grand Prix Gold in 2014. 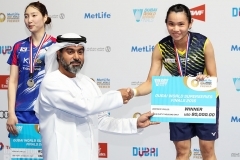 For Fitriani herself, making the final was already one rung up from her previous personal best, which was a runner-up finish at the 2015 Vietnam Open. Fitriani had the energy and the consistency and 2017 winner Busanan Ongbamrungphan never really looked able to threaten her opponent. 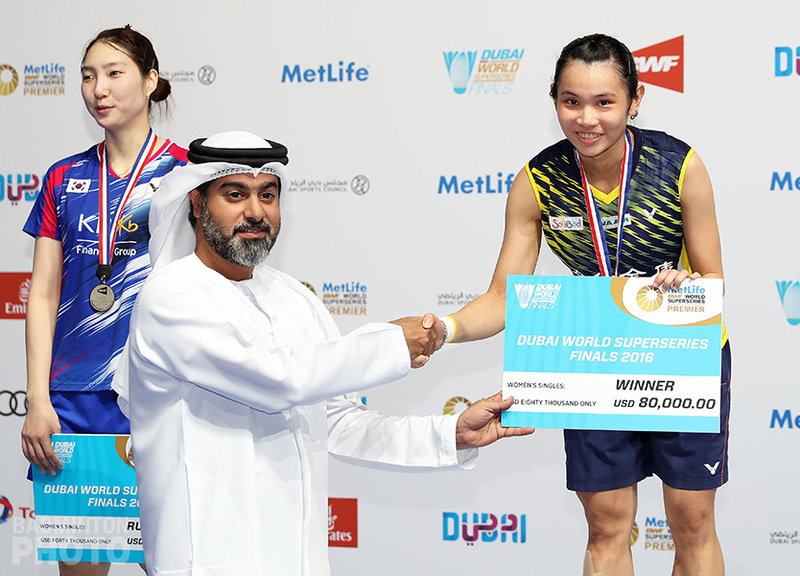 This one too was over in straight games and Busanan’s title drought now extends to two years while Fitriani’s winning ways have just begun. Home favourite Sapsiree Taerattanachai had two chances on finals day but she managed to come away with one title. The last time she had featured in two finals on one day ended in disaster as she had to retire from the women’s doubles gold medal match at the 2017 SEA Games and she was out for nearly six months. While she was away, her two partners teamed up and reached the final of this event in 2018. This time, Dechapol Puavaranukroh took on defending champions Chan Peng Soon / Goh Liu Ying (pictured bottom) with Sapsiree but was still not able to take down the Malaysians. Goh just piled on the pressure from the frontcourt and the Thais had a tendency to play a great rally but then play a loose shot upon finding themselves caught between trying to lift to Chan’s smash or squeezing the shuttle past Goh’s waiting racquet at the net. Later in the afternoon, Sapsiree did find the winning formula. Puttita Supajirakul was playing a Thailand Masters in her more successful discipline this time and after dropping their first game, the Thais gave the vocal local crowd exactly what they wanted, beating China’s Li Wenmei and Zheng Yu in three. The Thai supporters were so into the match that not only the local duo’s smashes but also their drives and even lifts with were punctuated by loud pulses of cheering from the partisan stands. 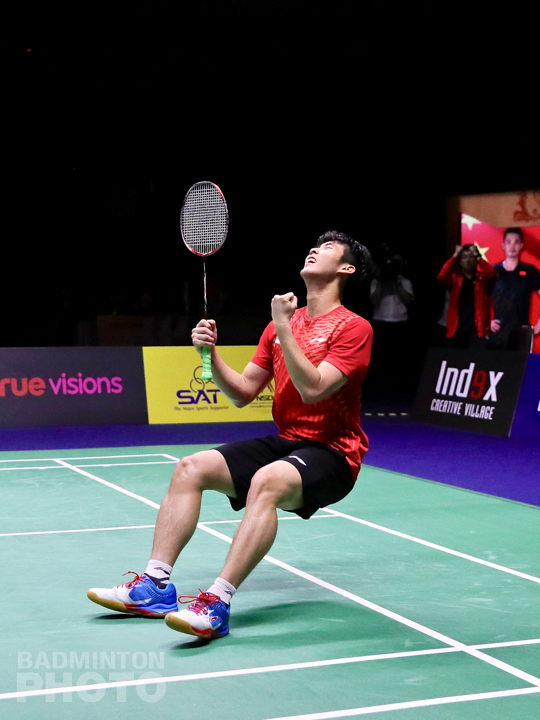 Immediately after Chan and Goh won their mixed title, their compatriots Goh V Shem and Tan Wee Kiong (pictured) wasted no time in taking the men’s doubles title. Goh and Tan played solid defense and devastating attacks to send off Chinese Taipei’s Lu Ching Yao / Yang Po Han in straight games and take their first title since the Superseries Finals in December 2017. 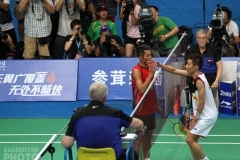 For both Malaysian pairs, it wasn’t just about winning. It was also important to see some success early after both pairs left their national team to strike out as independents. 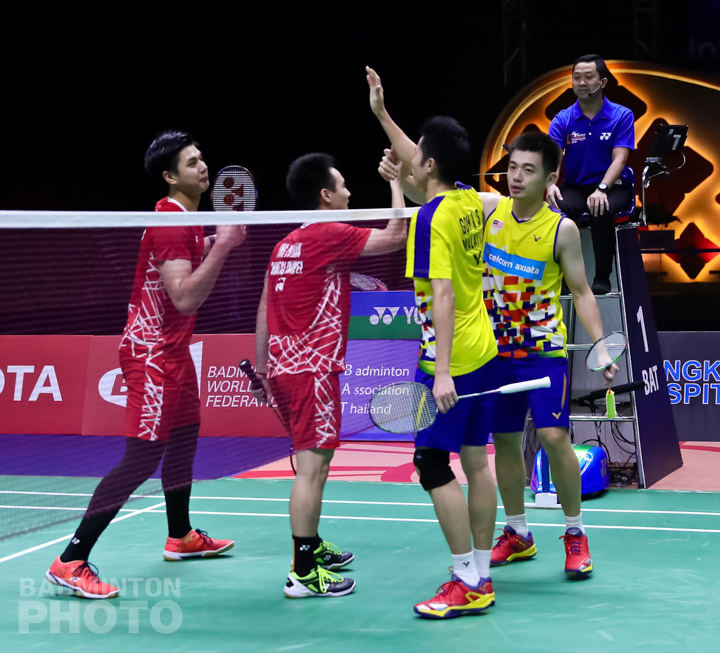 Supporting each other courtside from the coaches’ chairs, both of them came out on top and will be bolstered by the prize money and the confidence as they head home to try to make their mark on the Malaysia Masters Super 500.